The marriage of Joan of Kent to Edward, Prince of Wales, heir to the English throne proved to be in some ways quite as scandalous as her previous marital adventures with Sir Thomas Holland and William Montague, Earl of Salisbury. Ultimately it restored her to some respectability, but it was a near run thing at first, and much of it the fault of Joan and Edward themselves. On 28th December 1360 Joan of Kent’s first husband Thomas Holland, died in Normandy during negotiations over the Treaty of Bretigny in the Hundred Years War. 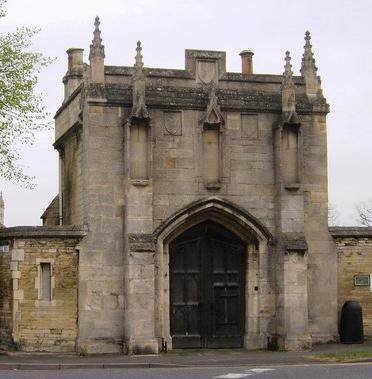 He was buried in Rouen but Joan in January 1361 insisted that his body be returned to England and buried in the Church of the Greyfriars in Stamford in Lincolnshire where she paid for three priests to pray for his soul in perpetuity. This entrance is all that remains of teh Greyfriars in Stamford. Thus Joan was the picture of a grieving widow, mourning the loss of a beloved husband. 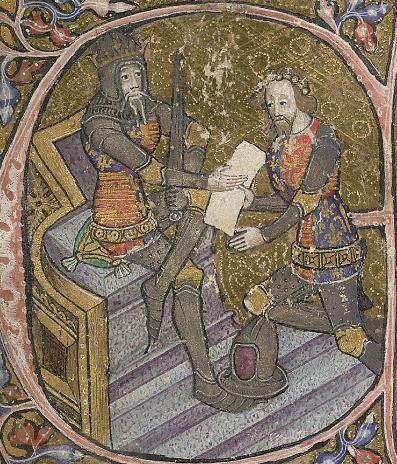 Yet within a matter of months, in late Spring or early Summer, Joan had entered into a private betrothal with Edward of Woodstock, Prince of Wales, known to history as The Black Prince. Here he is in his garter robes. This was a marriage that must have taken the court gossips of England and Europe by storm. Edward was the heir to the throne, the hero of Crecy and Poitiers. He would be expected to marry a woman of distinction, of royal blood, to father future heirs. Marriage to Joan, a widow without influence and some notoriety must have been seen as a lost political opportunity. Also not a wise choice for the English heir, given her dubious marital history and the scandal attached to her name. There was no political power or supremacy to be gained for Edward through this marriage. No English heir had married into the English nobility since 1066. Why did they leap so quickly into this marriage? Edward was thirty years old and still unwed. This in itself was unusual. His father had been negotiating marriages for him since his birth. The daughter of the King of France was under discussion when he was one year old. 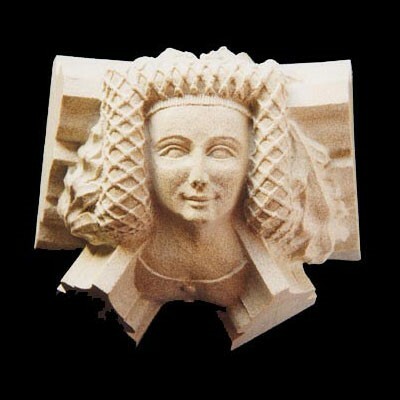 The most recent prospect was Margaret of Flanders, only child of the Count of Flanders and widow of the Duke of Burgundy. A much better match than Joan from an alliance point of view. Why was Edward not wed at the advanced age of thirty? Why no marriage to any of these? Why no pressure on him to marry and get an heir? It was quite an advanced age to be unwed and he often put himself in danger on the battlefield. It is suggested that King Edward was not as concerned as he might have been since he had other sons who were all well married by now. There was no problem about a future heir for England. So why did Edward decide to wed Joan and why so fast? Was it a love match? Tradition has it that it was a childhood love affair since the days when they were both brought up together at the royal court. Highly unlikely! Joan was two years older than Edward. When Edward was ten, Joan had already entered into her first marriage. This does to seem to be the scenario for a passionate love affair that stood the test of time. For whatever reason, they decided to wed without permission from the King, and it was here that Joan and Edward were not slow to create their own scandal. Against all good sense – and Joan’s past experience of this sort of marriage – they exchanged marriage vows per verba de praesenti which were frowned on by the church. Taken in any form of words of intent in the present tense, the ceremony needed no banns, no priest, no religious content. All that was needed were witnesses and consummation of the deed. This was the form of marriage that the church frowned on. Here is Joan from a roof boss in the Black Prince’s chantry chapel in Canterbury Cathedral. Furthermore, the marriage between Joan and Edward without a papal dispensation was both illicit and invalid, and could be punishable by excommunication if the Pope was of a mind to be difficult. 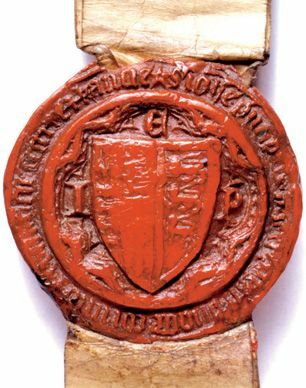 Their union was against the rules of consanguinity – they were related within the forbidden degrees through their joint great grandfather King Edward I – and also to compound the issue through compaternity since Edward was godfather to Joan’s Holland sons. Before Joan and Edward could produce legitimate children, this complication would have to be sorted out. Was King Edward III angry, when this marriage was admitted to? I doubt that he would be too pleased. Joan had cast the royal family into the lap of another scandal, but for the sake of the legitimacy of the future heir to the crown of England, this marriage must be made legal. It would prove to be both difficult and expensive, but Prince Edward was adamant that his marriage with Joan would stand. 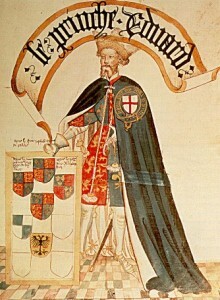 Both King Edward and his unrepentant son petitioned Pope Innocent VI for a papal dispensation, the Prince sending his esquire Nicholas Bond off to Avignon. The argument put forward was that the clandestine marriage was not in contempt of the rules, but with the honest intention of obtaining necessary authorisation after the event. The couple were so eager to be wed that they could not wait. Thus it was all put down to the lust of a healthy young couple. The Pope was petitioned to free the Prince and Joan from threat of excommunication and grant a dispensation so they might have a valid public wedding. 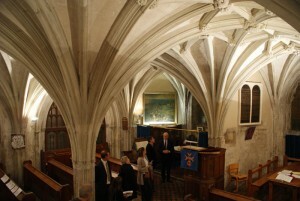 The Pope agreed, probably for a substantial fee, sending instructions to the Archbishop of Canterbury, which in September 1361 arrived at Lambeth Palace. It was quite a list. 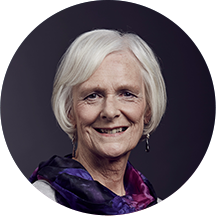 – the Archbishop must ensure the annulment of Joan’s previous marriage to William Montague since William was still alive. This marriage had already been declared null and void by papal bull in 1349. 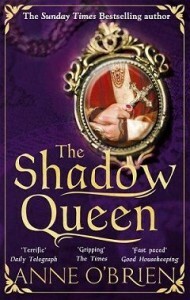 – the clandestine marriage in Spring 1361 between Joan and the Prince was to be declared null and void. – Joan and the Prince must promise under oath that they would never again enter into a clandestine marriage. – the royal couple were released from the penalty of excommunication if they agreed to build and endow two chantry chapels as a sign of their repentance. All this being done and promised, all impediment was removed from Joan and Prince Edward to make their new marriage, which must be public in the full view of church and court, valid. These legal documents were the ones which Joan kept safe for the rest of her life, in a coffer made specifically to house them, and which she handed over to her son Richard. Their existence would prove his legitimacy if it was ever questioned in the light of her past scandals, as it was at the time of the usurpation in 1399. Joan’s longstanding fears of the consequences of her spotty past were well founded. On 6th October 1361 Joan publicly plighted her troth to the Prince before Archbishop Islip at Lambeth and four days later, in presence of most of royal family including the King and a large congregation, the marriage was celebrated at Windsor. This was a very short time lapse in which to call the banns and arrange a royal marriage, but the King saw it necessary to get the legal knot tied as fast as possible before anything else could go wrong. Joan was now Princess of Wales, later Princess of Aquitaine, and the future Queen of England. This is a rare example of Joan’s seal. There were few festivities for the marriage at Windsor, leading to later speculation that the King and Queen disapproved of the whole affair and refused to celebrate it. This seems unlikely. Both King Edward and Queen Philippa spent Christmas with the newly-wed couple at the Prince’s estate of Berkhamsted where they were to spend the next few months, spending lavishly on rebuilding and decoration. It has also been said that Kig Edward packed them off to Aquitaine to allow the scandal to die down in England. This was also untrue. The plan for Prince Edward to become Prince of Aquitaine and rule there had been under discussion for many months before this problematic wedding. Was it a good marriage? It would seem to have been as good as most. Joan accompanied the Prince to Aquitaine where she gave birth to two sons, then returned with him and stayed close through his ill-health to his death in 1376. 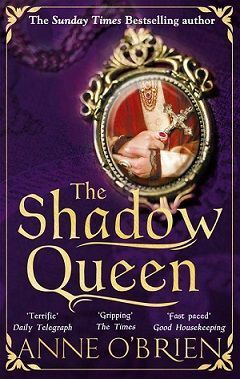 If Joan the Fair Maid of Kent intrigues you as much as she intrigues me, try my novel of this remarkable woman who left her imprint on English history, The Shadow Queen. What is the Chronological Order of my Novels? Some thoughts: was Joan, Fair Maid of Kent, a beautiful woman? You didn’t explain how Joan came to marry and leave William Montague, Earl of Salisbury, the 2nd husband. No I did not, Terry, because this blog was about her marriage to Prince Edward.